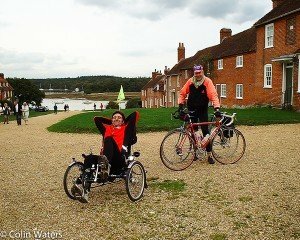 Fleet Cycling is the name of the Cycling UK Member Group in the town of Fleet, in North East Hampshire. Fleet Cycling seeks to promote cycling in the town for all cyclists and to publicise not only CTC rides but bike rides and routes of any cycling group in the Hart District who wants to use our website or link to it. Whether you are commuting to the station, to work or to school, or you just ride a bike for leisure then please contact Fleet Cycling and let us know how you would like to see cycling groups and cycle routes develop in the town. We are keen to encourage and help anyone wanting to join our group and we always cycle at the speed of the slowest rider, although we will help anyone choose which ride is most appropriate. 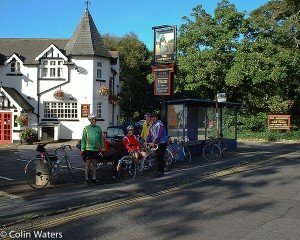 The club was part of the North Hampshire CTC (now Cycling UK) Member Group and has been meeting every Sunday morning at the Oatsheaf crossroads since the late 1980's, although we now meet at Hart Leisure Centre. In April 2014 a separate Member Group, Fleet Cycling, was formed. Nevertheless, we maintain close links with North Hampshire and support their cycle events whenever possible. When we renamed our group 'Fleet Cycling' we launched this dedicated website to publicise our rides and other aspects of cycling in the town of Fleet, Hampshire and the surrounding areas of Hart, the local District Council area which Fleet Cycling also covers geographically. There are now bike rides organised by Fleet Cycling every Tuesday, Thursday and Sunday. All these rides are ‘medium pace’, averaging about 12 to 13 mph. The cycle routes range from 30 miles to 60 miles. Fleet Cycling is also a focus for local Cycling UK Right to Ride Representatives who are engaged in dialogue with other bodies to promote and develop safer cycling infrastructure in the Hart District Council area and to enable and/or improve safe cycling routes between Fleet and adjacent towns. Anyone is welcome to come and try our bike rides as a guest rider, but we require regular riders to join Cycling UK (formerly known as CTC). See our Join page for details.